There were over 7 million cases of diabetes in Pakistan in 2015 and this figure is continually increasing. It is estimated that, if the rates of diabetes remain unchecked, by the year 2030, Pakistan would rank fourth in relation to the highest number of diabetic in a country. Diabetic retinopathy (DR) is a disabling complication of diabetes, and visual impairment or blindness caused by DR leads to serious socioeconomic burden resulting particularly in the working age group. It is an eye abnormality in which the human retina is affected due to an increasing amount of insulin in blood. The early detection and diagnosis of DR is essential to save the vision of diabetic patients. Early screening for ocular changes can prevent blindness and it requires motivating patients to contact appropriate healthcare facilities early in the process of disease and adhere to regular monitoring regimens suggested by ophthalmologists. Early screening can help in the prevention and control of retinopathy., Unawareness is observed to be associated with poorer control of DR risk factors and highlights room for improvement in DR prevention through better patient education and screening., While the awareness of DR is variable, specific knowledge about DR is low such that many patients have already experienced vision loss by the time they are screened. In several countries where studies have been conducted to assess the level of patients' awareness about DR, it is observed that there is considerable room for improvement. For example, in a study conducted among Hispanics, less than one-third knew that strict control could prevent eye problems, less than half knew that dilated eye examinations were important and a total of 30% of diabetic participants had had an eye examination in the previous year. Another study conducted in Brazil demonstrated that 81% of the diabetic patients present some knowledge about diabetes ocular changes, but they do not have precise information. In Kathmandu, it was observed that 21% of the diabetic patients on treatment had various grades of DR and 50% of the diabetic patients were not aware of DR. In a study conducted among diabetics in rural India, 49.9% had knowledge of DM and 37.1% had knowledge of DR. Compared with those who had no knowledge of DR (n = 1220), significant percentages of individuals with knowledge had the right attitude to go for regular eye examinations. Patients who participated in the educational intervention demonstrated an increase in knowledge across time. Patients may benefit from education, emphasising the importance of dilated eye examinations in the absence of ocular symptoms. Several researchers have explored rates of DR in Pakistan, reporting rates ranging from around 15% to 26% in various settings ,,, to as high as 33% among diabetics admitted in a teaching hospital of Lahore  and 43% among the Diabetic Association of Pakistan's outpatient department. There are yet no reports of any assessment of preventive and control measures taken by diabetes patients or their level of awareness about DR. Given the high rate of diabetes in Pakistan and socioeconomic burden of DR, assessing and enhancing people's knowledge about diabetes, DR and other diabetic complications is required. Responding to this need, and to combat DR-related blindness, Al-Ibrahim Eye Hospital, Karachi, in collaboration with the Sight Savers International Foundation, launched a major DR awareness and screening programme in a suburban area of Karachi, Pakistan. The objectives were to create awareness among the population of DR with emphasis on early detection through utilisation of available services. Prior to the launching of awareness programme, diabetes and DR-related knowledge, attitude and practices (KAP) of local population were assessed. This paper presents the observations about the KAP of diabetics living in Chanesar Goth which is a suburban area of Karachi. To assess the attitude of the community towards the use of these facilities. Prevention and control of diabetes-related blindness is planned to be carried out in one union council of Jamshed town during a 3-year project for the screening of diabetes and DR among the screened diabetics. Preproject KAP survey was conducted to explore the existing KAP of the diabetics aged 30 or above living in this community. This is a cross-sectional exploratory study in one union council (Chanesar Goth, Jamshed town). The selection of locality was purposive i.e., chosen to represent a low-income community where data collection was convenient. Within the locality, houses were selected by systematic sampling, for example, every 10th house was selected. Data were collected by trained lady health workers during their home visits of the families. Patients'' interviews were conducted with the help of questionnaire and responses were recorded on the questionnaires. The responses in most cases were open ended and later categorised according to themes and purpose for asking specific questions. What diseases are common these days? Have you ever heard about sugar (diabetes)? Do you have any idea what effects sugar has on body? On which part of the body, the impact of sugar is greater? What do you know about diabetes-related eye problems? What do you know about the treatment of diabetes-related eye problems? To explore attitudes towards diabetes and diabetes-related eye problems, agreement of particular statements was explored. If you have diabetes, when (and how) did you come to know that you have diabetes? If you have diabetes, how did you come to know that you have diabetes? From whom you are getting treatment? Since having diabetes, how many times have you got your eyes checked? What do you know about diabetes-related eye problem? Where do you think information about 'diabetes-related eye-lens-problem' is available? What advice would you give to your diabetic relative? How do you help your diabetic relative? Would you suggest the diabetic to get eyes checked frequently? Do you think there is anything that they should do and they are not doing? What treatment does your diabetic patient gets? The sample consisted of 59 (31.6%) males and 128 (68.4%) females. Age ranged from 20 to 85 years for females and 26 to 80 years for males. The mean age of males and females was 56 years and 49 years, respectively. The duration of diabetes ranged from <1 to 51 years for females and <1 to 40 years for males. The mean duration of diabetes for females and males was 6.8 years and 8.34 years, respectively. Fifty-four percentage of the patients had any diabetic in their family. Nearly all (96.3%) but surprisingly not 100% of the patients mentioned that they had heard about diabetes. Patients'' awareness about diabetes and DR was assessed by finding their identification of diabetes as a common disease, effects of diabetes on body and eyes and treatment options for diabetes-related eye problems. The details of responses received to such questions are summarised in [Table 1]. Majority of males (77%) and females (81%) were aware that diabetes is a common disease. Only a small proportion of patients (9%) mentioned the effect on eye sight as an effect of diabetes. However, when it was directly asked that what effect diabetes has on eyesight, a vast majority (around 70%) mentioned short-sightedness as an effect. 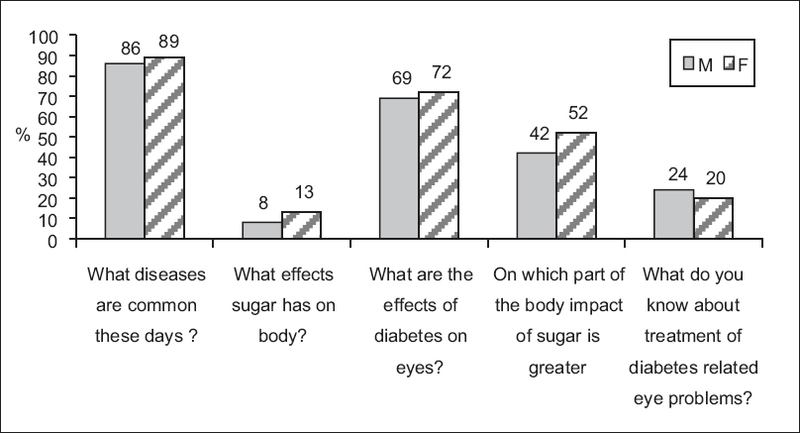 When the same question was asked as 'what do you know about diabetes-related eye problem? ', only 6% mentioned short-sightedness. Only 25% considered eyes to be the main area of body affected by diabetes whereas a higher proportion considered kidney (34%) and legs as the main area of body affected by diabetes. 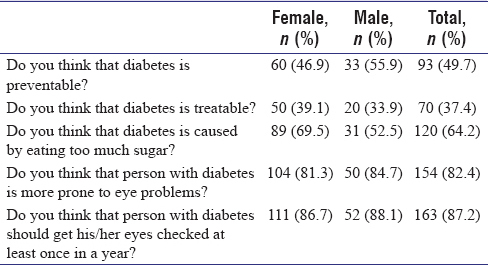 Frequency of correct answers to question about treatment of diabetes-related eye disease was relatively low (24% male, 20% female). Frequency of at least one correct answer to the above questions was higher among females for most of the questions. Responses to the above-mentioned questions were categorised as correct, partially correct and irrelevant or wrong. The percentage of patients who gave at least one correct answer to a particular question is depicted in [Figure 1]. Patients who gave at least one correct answer were titled as having good awareness and others as having poor awareness. Level of awareness was compared between younger and older groups and male and females. Chi-square test was performed to estimate statistical significance of differences. The proportion of patients having good awareness was significantly higher among females (53.1%) as compared to males (35.8%, P < 0.019) [Figure 2]. The proportion of patients having good awareness was significantly higher among those who had diabetes for 10 or more years (60%) as compared to those who had diabetes for shorter duration (42%, P < 0.026) [Figure 3]. Only half of the patients had a firm belief that diabetes is preventable and about one-third had belief that diabetes is treatable. 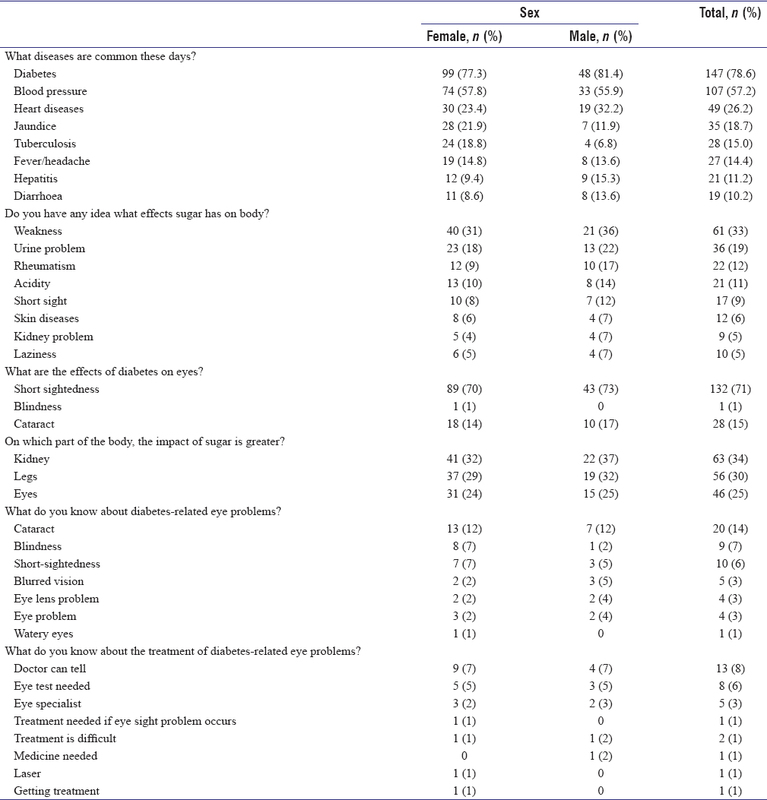 Nearly two-thirds were sure that diabetes is caused by eating too much sugar and a vast majority (>80%) had no doubt that people with diabetes are more prone to eye problems and should get his/her eyes checked at least once in a year [Table 2]. Those who responded about the time of knowing about their diabetes (i.e., 13%), the period mentioned ranged from 1 to 30 years. Most of the patients came to know about their diabetes through medical checkup done for a variety of reasons. Other reasons that led to diagnosis were urine problem and weakness [Table 3]. One hundred and sixty-three patients (87%, female, 88%, male) reported that they were getting some form of treatment for diabetes. Amongst those getting treatment, all the men and most of the women (97%) were getting treatment from a doctor. Other got treatment either from a traditional physician called 'hakeem' or both from 'hakeem' and doctor [Table 3]. Most of the patients reported (71%) treating their diabetes with medicine and around one-third by sugar-free diet. A vast majority (71%) have had their eyes checked at least once since having diabetes. Seventy-four percentage of patients (70% females and 81% males) reported having shared their diabetes-related experiences with their friends and family. About 53% (55% females and 49% males) had some ideas about place from where information about 'diabetes-related eye-lens-problem' is available. Amongst those who had any ideas, majority (around 90%) thought that information is available in the hospital and a small proportion (10%) considered that the information is available with the doctor [Table 3]. Patients'' eye testing practices were associated more with their attitude towards eye testing and their knowledge about the relation of eye problems to diabetes. All the patients who identified eye problems as an effect of diabetes (n = 18) had a firm belief in need for annual eye checkups, but not all of them were getting their eyes checked regularly. Four of them had never got eye test done. The frequency of eye testing was statistically significantly higher (P = 0.008) among patients who had better awareness as well as a firm belief in need for annual eye checkups. Among those who had low awareness and lacked firm belief, 53% never got their eyes checked, while among those who had a firm belief alone or firm belief with good awareness, only 23% never got their eyes checked. The proportion of patients who had got their eyes checked more than twice since the diagnosis of diabetes was highest among patients with both knowledge and belief about eye testing (35.3%), followed by those who only had a firm belief (19.7%) and was lowest than among those who neither had belief nor knowledge (9.1%) [Figure 4]. The most frequent advice given by the patients to their diabetic relative was to follow diet restrictions (70%). Other suggestions were to get checkup done and consult a doctor. The most frequently reported method of helping diabetic relative was advising about self-care (39%). Other methods of helping included suggestion for going to hospital and following diet restrictions. The most frequently reported required activities that the patients thought that their diabetic relative was not doing were: 'not following diet restrictions', 'not going to a doctor' and 'not taking medicine'. Amongst all the patients, taking medicine was the treatment that was being taken by the diabetic relatives of the patients (35%). This study has explored the various aspects of diabetes and DR-related KAP of a selected group of diabetics living in Karachi. This study had a small sample size and was limited to one locality; however, because of data collection by local lady health workers, there was a good assurance of validity of data. Larger studies can definitely provide more detailed information nonetheless the observations made in this study provide advocacy and guideline for awareness campaigns and further research. As observed in another study in Turkey, we also found that, as compared to knowledge about the effect of diabetes on eye health, level of awareness about the prevention and management of DR was less. We observed that patients look towards healthcare centres as their main source of information, thus employing trained diabetes educators to provide comprehensive diabetes education including education about the prevention of retinopathy can increase the level of awareness about care practices. As noted in other studies from South Asia, we also observed that women had better awareness of diabetes and DR; however, men were more likely to believe that diabetes is preventable and less likely to take alternative medicine. These gender differences in awareness and belief could be used in determining areas to be focused while educating men and women. Level of awareness was higher among those who had diabetes for a longer duration. The association of duration of diabetes with level of awareness has been reported by others also. This indicates the possibility of success for peer-support diabetes education programmes. Educational interventions should focus on inculcating positive attitudes and firm belief in the importance of self-care and seeking appropriate and timely treatment as well as on options available in relation to the treatment of diabetes-related eye problems. Reason for lack of regular eye testing in spite of being aware of its need should be explored. It has been identified by other researchers also that the main barriers to receiving adequate screening were lack of knowledge regarding the need for ocular examination. Another area of improving self-care includes creating better awareness about diet and nutrition. It has been known since a long time that, by integrating nutritional strategies, the risk of developing DR can be reduced substantially. However, in this study, patients were mainly aware of avoiding sugar and diet restrictions and not about the role of nutritious diet. While an earlier review about DR in developing countries concluded that the awareness was not translated into a positive practice, our observation evidenced significant positive association between the level of awareness and belief and frequency of eye testing. This observation provides hope that, by providing good-quality diabetes education, we can convince patients to take better preventive care and the rates of DR-related loss could be reduced. It has been concluded by other researchers also that, although the reasons for low adherence involved social, emotional, cultural and economic factors, the key issue was the lack of awareness and knowledge of DR. The level of awareness and belief in association between diabetes and eye problems influences patients' care practices, and investing in evidence-based culture-specific diabetes education programmes could control the rates of DR-related blindness. Women and people with the experience of managing their own diabetes are good within community resources that can be utilised for developing local diabetes education programmes. Data collection was facilitated by Al Ibrahim Eye Hospital and lady health workers of Union Council, Chanesar Goth, Jamshed town, Karachi. Funding for this project was provided by Sight Savers International Foundation. Dr. Haroon Awan and Niaz Khan from Sight Savers International Foundation assisted in developing the baseline idea of this study. International Diabetes Federation. IDF Diabetes Atlas 2009. Pakistan: International Diabetes Federation; 2015. Usman Akram M, Khalid S, Tariq A, Khan SA, Azam F. Detection and classification of retinal lesions for grading of diabetic retinopathy. Comput Biol Med 2014;45:161-71. Qing S, Yuan S, Yun C, Hui H, Mao P, Wen F, et al. Serum miRNA biomarkers serve as a fingerprint for proliferative diabetic retinopathy. Cell Physiol Biochem 2014;34:1733-40. Vashist P, Singh S, Gupta N, Saxena R. Role of early screening for diabetic retinopathy in patients with diabetes mellitus: An overview. Indian J Community Med 2011;36:247-52. Hussain R, Rajesh B, Giridhar A, Gopalakrishnan M, Sadasivan S, James J, et al. Knowledge and awareness about diabetes mellitus and diabetic retinopathy in suburban population of a South Indian state and its practice among the patients with diabetes mellitus: A population-based study. Indian J Ophthalmol 2016;64:272-6. Lin S, Ramulu P, Lamoureux EL, Sabanayagam C. Addressing risk factors, screening, and preventative treatment for diabetic retinopathy in developing countries: A review. Clin Exp Ophthalmol 2016;44:300-20. Pereira GA, Archer RL, Ruiz CA. Evaluation of the knowledge that patients with diabetes mellitus demonstrate about ocular changes due to this illness. Arq Bras Oftalmol 2009;72:481-5. Shrestha S, Malla OK, Karki DB, Byanju RN. Retinopathy in a diabetic population. Kathmandu Univ Med J (KUMJ) 2007;5:204-9. Rani PK, Raman R, Subramani S, Perumal G, Kumaramanickavel G, Sharma T, et al. Knowledge of diabetes and diabetic retinopathy among rural populations in India, and the influence of knowledge of diabetic retinopathy on attitude and practice. Rural Remote Health 2008;8:838. Wagner H, Pizzimenti JJ, Daniel K, Pandya N, Hardigan PC. Eye on diabetes: A multidisciplinary patient education intervention. Diabetes Educ 2008;34:84-9. Afghani T, Qureshi N, Chaudhry KS. Screening for diabetic retinopathy: A comparative study between hospital and community based screening and between paying and non-paying patients. J Ayub Med Coll Abbottabad 2007;19:16-22. Basit A, Hydrie MZ, Hakeem R, Ahmedani MY, Waseem M. Glycemic control, hypertension and chronic complications in type 2 diabetic subjects attending a tertiary care centre. J Ayub Med Coll Abbottabad 2005;17:63-8. Jamal-u-Din, Qureshi MB, Khan AJ, Khan MD, Ahmad K. Prevalence of diabetic retinopathy among individuals screened positive for diabetes in five community-based eye camps in Northern Karachi, Pakistan. J Ayub Med Coll Abbottabad 2006;18:40-3. Khan AJ. Prevalence of diabetic retinopathy in Pakistani subjects. A pilot study. J Pak Med Assoc 1991;41:49-50. Kayani H, Rehan N, Ullah N. Frequency of retinopathy among diabetics admitted in a teaching hospital of Lahore. J Ayub Med Coll Abbottabad 2003;15:53-6. Shera AS, Jawad F, Maqsood A, Jamal S, Azfar M, Ahmed U, et al. Prevalence of chronic complications and associated factors in type 2 diabetes. J Pak Med Assoc 2004;54:54-9. Cetin EN, Zencir M, Fenkçi S, Akın F, Yıldırım C. Assessment of awareness of diabetic retinopathy and utilization of eye care services among Turkish diabetic patients. Prim Care Diabetes 2013;7:297-302. Thapa R, Poudyal G, Maharjan N, Bernstein PS. Demographics and awareness of diabetic retinopathy among diabetic patients attending the vitreo-retinal service at a tertiary eye care center in Nepal. Nepal J Ophthalmol 2012;4:10-6. Sharma Y, Saxena S, Mishra A, Saxena A, Natu SM. Nutrition for diabetic retinopathy: plummeting the inevitable threat of diabetic vision loss. European Journal of Nutrition. 2017;3:1-5. Duan F, Liu Y, Chen X, Congdon N, Zhang J, Chen Q, et al. Influencing factors on compliance of timely visits among patients with proliferative diabetic retinopathy in Southern China: A qualitative study. BMJ Open 2017;7:e013578.